Israeli bulldozers destroy 23 houses in two West Bank villages within controversial ‘military’ zone in one of biggest demolitions of recent years. Israeli military bulldozers have demolished 23 houses in two impoverished southern West Bank villages, including structures that were home to more than 100 people. The demolitions, one of the most significant in recent memory, occurred in a controversial Israeli-designated military area known as Firing Zone 918, which comprises approximately 115 square miles (300 sq km) and was declared restricted by the Israelis in the 1970s. The action came despite a long-running and internationally high-profile campaign to protect the eight villages in the zone, including a petition signed by some of the world’s most famous authors. Human rights groups have repeatedly challenged Israel’s claim to the land, arguing it is illegal to establish a military zone in occupied territory. Tuesday’s demolitions were described by the Israeli veterans group Breaking the Silence – which has long supported the villages – as one of the biggest demolitions in the past decade. Israeli bulldozers moved into Khirbet Jenbah and the nearby hamlet of Khirbat el-Halawa just after dawn on Tuesday morning, destroying a dozen homes in Jenbah itself as well as other structures, some of which are funded by European countries including the UK. 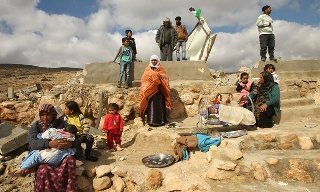 According to Israeli NGO Peace Now, among the 110 people made homeless during the demolitions were dozens of children from 12 different families. The 12 buildings destroyed were among 40 properties that had been earlier earmarked for destruction, in three locations in a remote area of rolling hills accessible only by dirt roads. The destruction of the remaining buildings was temporarily halted after lawyers for the villagers obtained a court injunction, which provided a stay of execution until next week. The families, many of whose homes are attached to caves that are also used as houses, argue that their families have lived on the land since long before Israel occupied the West Bank in 1967. Villages like Jenbah are some of the poorest in the West Bank, unconnected to the grid and reliant on donated solar panels, some of which were destroyed by the Israeli military. On Tuesday villagers dug through the remains of their homes, set up temporary tents and transported furniture they had managed to save from houses to the places they planned to sleep. A few metres away Mahmoud Ahmad Isa, 30, watched as members of his family moved furniture down a flight of stone stairs into a cave entrance next to the wreckage of his home. Two years ago 51 acclaimed international authors, among them Mario Vargas Llosa, Seamus Heaney and Orhan Pamuk, signed a petition asking the Israeli government to allow the villages to remain. It is also not the first time the Israeli military has destroyed Khirbet Jenbah. The village was demolished in its entirety in 1999. The villagers, however, returned later and won a court ruling allowing them to stay on the land if they agreed to arbitration with the military. On Monday, however, the state of Israel declared that mediation had failed because of the villagers’ unwillingness to relocate,. A statement from Cogat, the Israeli defence ministry unit that administers civilian affairs in the West Bank, confirmed that “enforcement measures were taken against illegal structures and solar panels built within a military zone”. Cogat said the negotiations failed as “the building owners showed no willingness to get the situation in order and illegal construction did not stop”. As such, “measures were taken in accordance with the law”, it added. Campaigners on behalf of Jenbah and other villages in the south Hebron hills – and more widely in Area C – point out, however, that Israel consistently refuses to give building permits to villagers or permit development of communities despite allowing construction by Jewish settlers in the same hills. Others flagged up the timing of the demolitions. Knesset member Dov Khenin of the Israeli Arab Joint List said he had written to Israeli defence minister Moshe Ya’alon pointing out that the house destructions would leave people homeless in the middle of the cold winter months. “The decision came without prior warning, in a sudden and extreme move that will leave many families without a roof over their heads during the winter,” Khenin said.